Jacques Lipchitz was a leading Cubist sculptor of the early twentieth century, applying the faceted, geometrizing manner he had learned primarily from Pablo Picasso and Juan Gris to such familiar Cubist subjects as sailors, musicians, and bathers. 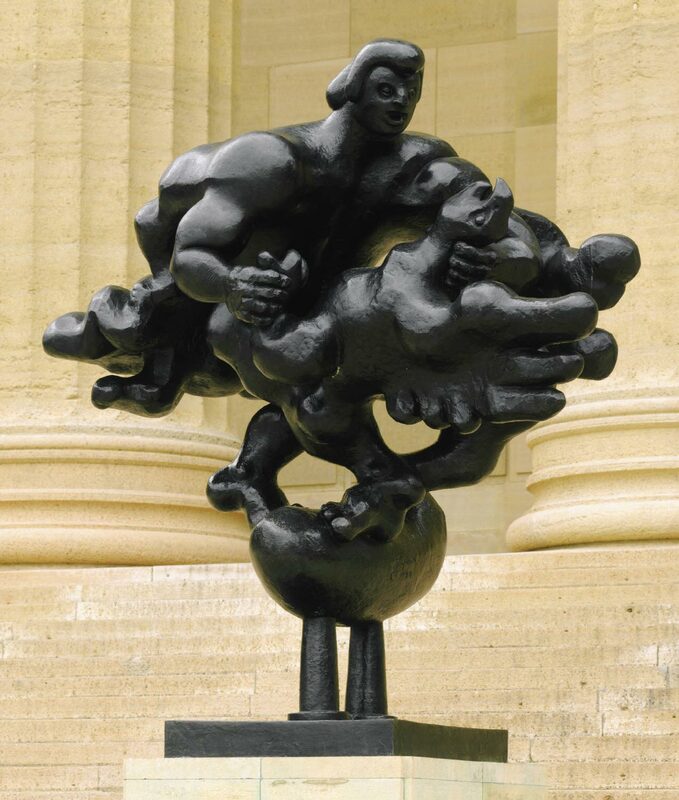 During the 1930s and 1940s, however, Lipchitz's style and subject evolved toward monumental depictions of mythological and biblical conflicts as he sought to respond to world events, particularly the rise and spread of Fascism, from which he himself had to flee. Philadelphia boasts a strong group of his monumental sculpture, such as this one. In Prometheus Strangling the Vulture, Lipchitz represented the mythic Greek hero who brought fire to humans, here locked in deadly struggle with the winged beast sent by the gods as punishment for his independence. Balanced gracefully on a tiny cloud, the muscular Prometheus will clearly be the victor as he throttles the bird with one hand and fends off his talons with the other. Lipchitz's version of this ancient story, with its clear distinction between good and evil, was meant to warn contemporary society about the importance of its own struggles but is not without optimism. John B. Ravenal, from Philadelphia Museum of Art: Handbook of the Collections (1995), p. 330. This dynamic sculpture dramatizes Lipchitz's personal revision of the Greek myth of Prometheus, who stole fire from the gods and brought it to man. In his fury at the theft, Zeus sent an eagle to pluck out the liver of the audacious rebel. According to the myth, Prometheus is rescued by Hercules. In Lipchitz's version, Prometheus himself vanquishes the bird (transposed to a vulture), grasping its talons and throat with his two hands. Prometheus functions as an autobiographical telling of Lipchitz's own artistic struggles. The story dates back to a sculpture he made as a commission for the Paris World s Fair of 1937. Having abandoned his earlier Cubist style, Lipchitz created a work of robust volumes he found appropriate to a monumental work of mythological force. During a grim time, the sculpture seemed to him a necessary reminder of heroism in the face of assault. Unfortunately, soon after its display at the fair, the sculpture was mutilated by an attack and destroyed. Lipchitz's subsequent version, made for a government building in Rio de Janeiro in 1944, was also ill fated: without the artist's involvement, the model was poorly cast into a bronze that Lipchitz promptly repudiated. In 1952 Lipchitz entered the plaster model for his Brazil commission in the annual sculpture exhibition at the Pennsylvania Academy of the Fine Arts, Philadelphia, where it won the grand prize. The day after he sent the piece to Philadelphia, his New York studio was ruined by fire. Inspired by their respect for the sculpture and by its narrow escape, the trustees of the Philadelphia Museum of Art commissioned Lipchitz to cast the plaster in bronze. Its presence on the front steps of the Museum salutes a sculptor who personally overcame obstacles. The triumph of the fire-bearer Prometheus, often regarded in mythology as the first artist, speaks for all those whose work is displayed in the building beyond. Twentieth Century Painting and Sculpture in the Philadelphia Museum of Art (2000), p. 93.